What mission has the US accomplished in Syria? US President Donald Trump announced on Saturday that the US-led strikes in Syria were a “mission accomplished”, adding that he had no intention of launching further strikes against President Bashar al-Assad‘s targets. Trump’s announcement came hours after US, French and British forces launched strikes against three sites, which according to the US president are associated with the chemical weapon capabilities of Assad. The coordinated strikes came as a response to the Syrian regime’s alleged use of chemical weapons in Douma last week, killing scores of civilians. But Twitter reality is far different from the reality on the ground in Syria, where many indicators point to the fact that the strikes did not cripple the Syrian government’s capabilities, nor did it affect Assad’s morale. The war in Syria, which entered its eighth year on March 15, has caused the destruction of most Syrian cities, killing nearly half a million people and forcing six million more to flee their homes. Yet the select bombardment of chemical facilities could not be expected to end a crisis on as big scale as Syria. According to several analysts, the strikes have achieved one goal only: not to provoke Russian forces in Syria, thus minimising any possibility of an escalation between Moscow and Washington. Contrary to Trump’s strong language and threats before the attacks, the mission did not have any impact and only helped Assad’s regime to gain a new moral momentum. This failure, which Trump presented as a great achievement, was echoed in British Prime Minister Theresa May‘s statement, saying the strikes were not about “regime change” or “intervening in a civil war”, but were to “deter the use of chemical weapons” by the Syrian government. French Foreign Minister Jean-Yves Le Drian also said that the attacks did not target Syria’s allies, in reference to Russia and possibly Iran and Hezbollah. Even the Pentagon, the US Department of Defense, stated that the strikes were not aimed at changing Assad’s regime, but rather were intended to deter Assad from using chemical weapons. Various political analysts revealed that Trump’s goal behind the strikes was simply to ease the burden of the scandals that had beset him in Washington, such as the FBI questioning of his personal lawyer Michael Cohen. US-led Syria strikes: A distraction from Trump’s troubles? Yet it remains unclear what effect, if any, the US-led strikes had on alleviating the suffering of Syrians. On the battlefields, Assad forces are making more gains, and Syrian rebels continue to count their losses on various fronts. The majority of Syrians find themselves once again disappointed by those who call themselves friends of the Syrian people, while their reality stagnates or becomes even worse. 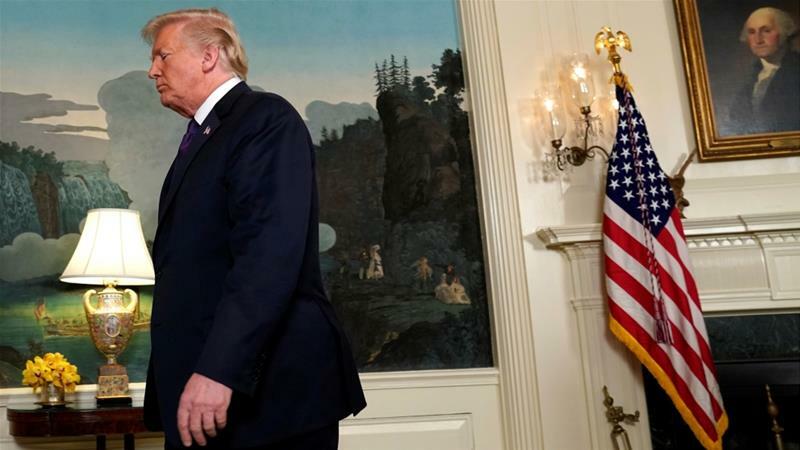 Ibrahim al-Marashi, an associate professor of history at California State Univesity, told Al Jazeera that the US strikes embody “largely symbolic actions with little consequence on the ground”. “This dissonance in US policy to Syria reveals a lack of a coherent strategy, in contrast to Russia and Iran which have demonstrated a steadfast determination in propping up Syrian President Bashar al-Assad,” Marashi said.